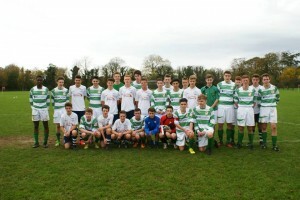 Halloween saw Knocklyon Utd Under-16 Premier side go on one very special trip. First the team had to assemble in Supervalu Car Park for a very early start; the 6.15am bus that would take Gary’s gang on a trip which would include a visit to Manchester, a Preston Academy match and to the Brittania to see a Premier League clash between Stoke City and West Ham United. DB Sports Tour’s Darren Scully was there to welcome everyone; from start to finish the trip ran smoothly. Thanks to David Berber, Darren, Joe our bus driver and all involved in making the weekend a great success. Knocklyon’s new Head of Football Development, Gary Farrell, was there alongside the few hardy soles not making the trip to wave off the lads with pride as they headed off on their journey. It was not long before our Knocklyon Dubliners were on board the famous Ulysses, and despite the best efforts of the obligatory drunk who latched on to our group, the crossing was a pleasant one. All in it was good fettle for the bus ride that would firstly take us to Old Trafford for a bite in the Red Café, which was followed by tour of the ground. Red cafe potato skins were just the right meal to fill the gap before dinner later in our Didsbury Brittania hotel. And by the way, the Old Trafford bottomless coke is fantastic value, and was enjoyed by at least 11 if not the full squad! The tour itself of Old Trafford was interesting, but a lot of Sir Alex to take in one session, More Red Nose Day than Halloween! We then went back on bus and then on to the hotel. There was an exemplary observed early night by our under-16 team which showed that management and players were focused on the next morning’s big game against Preston’s academy team. David Berber had also organised a presentation from Manchester United Academy head man Derek Langley; an eye opener with some amazing stories and many a tale which demonstrated the harsh reality of trying to make it in the professional game. The odds against are scary; so many more hard luck cases than successes. But still, all you can do is believe you’re still in with a chance. The Preston academy training facilities were located with relative ease. There was a really impressive set up as the club which is shared with the local University. The facilities really looked the part which had an immaculate surface and referee along with two assistant refs awaited the teams. Preston had a top of the range looking group as we eyed their warm up routine. They had a few Irish lads in their ranks too including keeper who was over on a week’s trial from Cherry Orchard. We all wondered whether our lads give a good account of themselves. Well we started well and the Hoops had a couple of chances to go ahead but it was not to be. Midway through the first half and against the run of play, Preston took the lead. The home side’s confidence rose sky high as they then added a second goal. Our guys were put under constant pressure and for a moment the worry of a heavy loss loomed large. But some astute tactical formation adjustments to the Knocklyon team changed the game completely; the hoops then got on top of things and dominated the game. It was of no great surprise when there was two great headed goals from Gary Murphy, one either side of half time which levelled proceedings. A frantic end to end to game resulted in Preston nicking a late goal to edge the game 3-2. It was a pity that Knocklyon did not get at least the draw which their performance deserved. But far more importantly was the way the impressive manner which the team played. Preston heads were turned and a couple of our players certainly caught the eye Saturday morning. Who knows what the future holds? With game over, we said our goodbye to hosts Preston and their staff including a couple of Irish under-17 internationals. JJ and Whelo who are settling in well to their new home as they start on the road to what we hope will develop into a professional career. The afternoon game between Stoke and West Ham at the Brittania was chosen by Sky as the Premierships Match of the Day. Right choice! It ended up being a highly entertaining game with Stoke unlucky not to take all three points. Downing saved the day for West Ham when it looked like Bojan and our very own Jonathan Waters were going to inspire Stoke City to victory. Notably there was a nice touch by Jonathan Waters after the game as he returned to the travelling Irish DB Sports Tours group contingent. He stayed well beyond the time you would expect and made many a young and not so young persons day, getting in countless pictures and signing loads of autographs. Our trip ended with a nice get together in the hotel for the last night. In the morning we got on the return bus which brought us to the Ulysses on Sunday. The sail ome was pleasant and went off perfectly. Watching the Manchester Derby on television too followed by Spurs Villa duel. Ah..sure what more could you want??? ?